It's almost like she and I were meant to be complete strangers with an unthinkable tragedy in common. I turn on the GPS, then spend the next five minutes trying to change the lady's accent to British. I'm one of those people with too much time on her hands, letting the wind take me to unproductive places where I mess with the settings of electronics. Then I remember that's the whole point. The under-arching theme of the trip, even. To sit still long enough to find a part of my personality I enjoy being around more, or become a completely different person who doesn't dissect her personality into parts. "I need my phone," Juliette says, after a smaller calf surfaces beside its mother. "Not yet," I tell her - not pushily, just firmly, trying to convey that this is a moment to experience before document. "Just watch with me for a few more seconds." I take her hand. She doesn't argue when I say this is something that can't be accurately capture with a photo, anyway. Simply put, Finding Mr. Brightside is adorable. In a genre full of misunderstandings, teenage angst, and "fixing" the bad boys, this novel is such a breath of fresh air. Now don't get me wrong, I am a fan of those plot aspects, but this is such a "normal" and easy relationship that it's easy to get lost in the simplicity of everything. Well, maybe not terribly simple. After a chance run in at CVS while getting persecutions filled (neither of them are coping with with the death and deceit of their parents), and a subsequent Taco Bell run, Abram and Juliette find themselves drawn to each other. A bit odd given the circumstances surrounding their families but they don't allow it to effect them too much, slowly allowing their new friendship to grow into a romantic relationship. One of the drawbacks for me is that the secondary characters aren't really fleshed out. I know the secondary characters aren't nearly as important as Abram and Juliette but they all felt very surface level. But at the same time, Finding Mr. Brightside is just over 200 pages and fleshing out these characters could have created a lot of unnecessary and dragging plot aspects. Jay keeps the focus of his story on Abram and Juliette more so than their (living and dead) parents and friends. 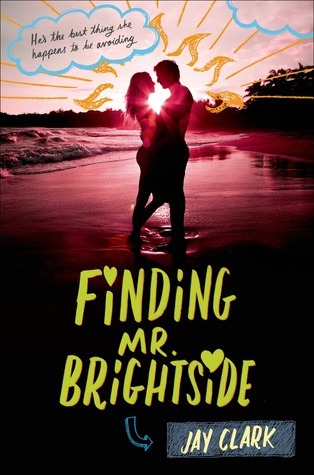 If you're looking for a drama free and (relatively) easygoing relationship with two strong voiced characters, quirky narration, and an all around fun refreshing novel, you'll definitely want to read Finding Mr. Brightside. Welcome to Bookish, Jay! I'm so excited to have you with us today! One of the things I truly loved about your novel is that Abram and Juliette felt and sounded like teenagers, not 20-somethings stuck in a teenage body, which was rather refreshing. How do you put yourself into the mindset of two very distinct teenagers dealing with the loss of a parent and the revealed deception of said parent? For the grief stuff, I play sad songs on repeat and make myself believe it’s not going to be okay, nothing’s ever going to be okay, until I get over it and try to bring something positive from the depressing onto the page. The process is much healthier than it sounds. I keep my main draft in a Word doc, but I can’t do the majority of my writing in it because that would make too much sense. Instead, I write in Evernote (where I feel far more free to mess everything up) and then transfer the good stuff over to the Word doc. Weird formatting issues ensue. Wait, you said interesting writing quirks, didn’t you? On writing breaks, I play tennis against the brick wall of my living room ... which is a lot like writing, come to make a metaphor out of it. What is the most awkward moment/question you have had since becoming an author? Which celebrity (writer, actor, whatever) would you be so excited to see that you would actually widdle with joy? Steve Martin. I’d try to say something funny to impress him but no sound would come out—not even a whistle because I don’t know how to whistle—which is probably for the best, everything doesn’t happen for a reason. If I was magically transported back in time to the Dark Ages, I'd . . . be like, Phew, no more group texts for a little while, I needed a breather from digital conversations that never go anywhere. Then I’d take my phone out and google “What to do in the Dark Ages?? ?” until the reality of living in a worldwide WiFi Coldspot hit me again, this time in a bad way. Panicking, I'd buy myself a mysterious cloak from an up-and-coming peasant/entrepreneur in an attempt to blend in (in a mysterious way), and then I’d start roaming around, pretending to appreciate the scenery even though I can’t see crap, it’s too dark!! !, and I'm really just looking for the nearest portal back home. One time I spontaneously . . . ordered a sausage & cheddar breakfast sandwich from Starbucks and kept ordering the same thing almost every day from January 2014-March 2015. I'm addicted to . . . certainly not breakfast sandwiches, I’m still in denial about that. If I could tell the world just one thing, it'd be . . . we’re all okay. And not to worry, ‘cause worry is wasteful and useless, and I’m singing Hands by Jewel and this is supposed to be a serious question, why am I wired like this?